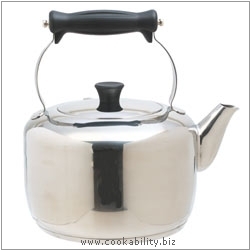 Master Class traditional style, medium, heavy duty farmhouse kettle with easy to hold stay cool handle and knob, encapsulated base for even heat distribution and clearly marked Max Water Level markings to ensure safe use. Suitable for use on all conventional hobs. Kettles need to be regularly descaled.